TsukuBlog | Thar She Glows! 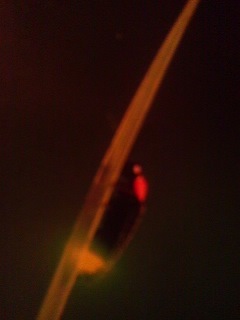 Fireflies (蛍) Make a Strong Comeback Not Far From Tsukuba Center – Soon (at the end of June) they will be at their best! Getting around Tsukuba ON FOOT can sometimes pay off. Even at night, when its raining! Four years ago, after having been stood up for an appointment near Tsukuba University, I headed for home on foot. There was a slight drizzle which soon turned into a steady shower. I was heading East, and the narrow rice-paddied valley along the banks of the Hanamuro River is almost completely shielded from any light. It was like walking into a bygone age. I crossed the river and the croaking of the frogs turned from a hum into an almost deafening roar. I realized that the farmers must be making rice for THEIR OWN CONSUMPTION on this side of the valley and using LESS PESTICIDES. Thus the abundance of LIVING CREATURES. Turning southward along the field I was startled by a delicate streak of dancing light! I stopped in my tracks even though I was getting wetter by the minute. A spot of light and then more streaks here and there filled me with the thrill of discovering a species long thought extinct. There were wild fireflies (hotaru,蛍) here! Four summers LATER, the shiny critters can surprisingly still be seen at the same spot. The reason it is surprising is that there has been some home construction in the area and I was worried that the purity of the area had been disturbed. Last night, cycling back home I found myself passing through a gentle swirl of streaking lights. I stopped for a while to enjoy and will surely be back, at night, several times before the season is over! Older Japanese fondly remember the abundant fireflies, which before the widespread use of agricultural chemicals (especially those sprayed from helicopters by local governments), would delight them each rainy season. Catching fireflies in a jar was once one of the most popular and memorable childhood games of summer. Now children have to be taken to special parks or institutes which artificially breed the light-making insects. Fees are charged and large crowds make the setting highly commercialized. There are two main types of fireflies in Japan. The larger type is the Genji-botaru and the smaller one the Heike-botaru (they are named after the two warring clans of the late Heian Period which in English we refer to as the Minamoto and the Taira).To tell the truth,Im not sure which types the ones I found are. There are dozens of great poems inspired by the firefly with many going back to the Manyoshu, the great collection of poems compiled in the Nara and Early Heian Periods. Of course, it is possible to see wild fireflies at a few places in Japan and even in Tsukuba City (on Mt Tsukuba for instance, or nearby it- in Yamaguchi or Kangori). It was exciting however to find that the little love sick bugs might be making a comeback with walking distance of Tsukuba Center. If you’d like more details about where to go Hotaru viewing, contact me. I will try to get a map with details posted soon. just read your article about the Hotaru. Would love to go, minus the heavy transportation fees. is this the river east of Takezono. I’d like to request more information. You mentioned a map. It would be greatly appreciated. Hello Richard and thanks for writing. You are correct in that the Hanamuro River is just east of Takezono. Where the fireflies can be seen is north of the Tsuchiura Gakuen Line, however, in the neighborhood called Higashi-Oka. The easiest way to get there would be to turn left at the Hanamuro Inrtersection ( if you are coming from Tsukuba Center) and go straight through the first traffic signal. After a few hundred meters you will see the illuminated tennis courts on the right side of the road ( these are part of the old Sakura Branch Office). When you get to these courts, slow down, because you will want to turn left on the narrow road just opposite a small community center and Fudo Worship Hall ( a traditional structure ). When you do make that turn DO NOT GO STRAIGHT as it is a dead end. Take the first bend and then follow it all the way down towards the paddy-field filled valley. THings will be completely DARK there. You will find the fireflies at the edge of the paddy fields just at the bottom of the hill you will go down. Walk up and down that narrow road and you will surely find plenty of fireflies.